A truly portable tube beveling tool which has been upgraded with a new battery that lets operators fit-up boiler tube panels virtually anywhere has been introduced by Esco Tool of Holliston, Massachusetts. The ESCO Mongoose MILLHOG® Battery Powered Beveling Tool is a self-centering I.D. clamping right angle drive tool that can bevel, face, and bore simul-taneously and can also be supplied with a cutter head for membrane and overlay removal. 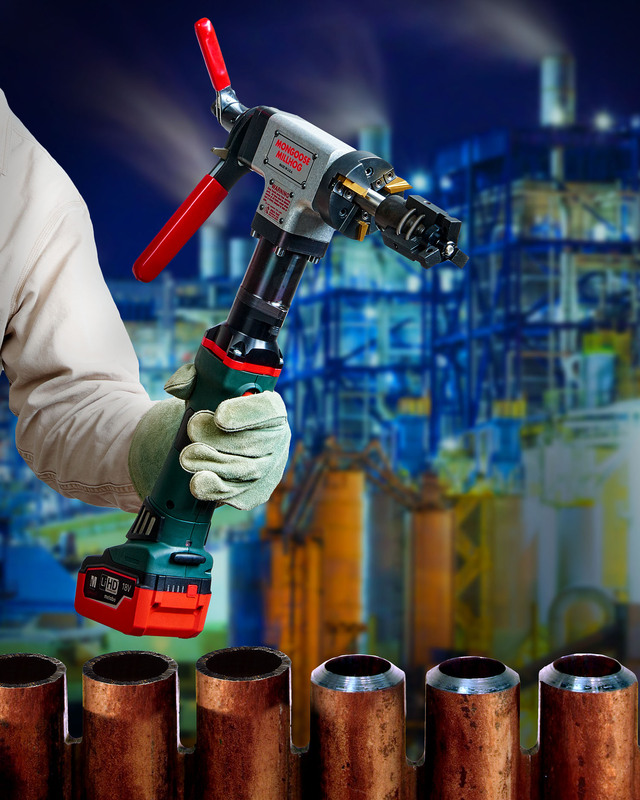 Now offered with a 6.2 Ah, 18V rechargeable battery, this narrow body tool is ready to fit-up boiler tube panels virtually anywhere. Allowing up to 1 hour operation, depending upon the application, the ESCO Mongoose MILLHOG® Battery Powered Beveling Tool is suited for 5/8” I.D. to 3” O.D. tubes and only needs 2.25” min. clearance. Providing chatter-free operation without cutting oils, this portable tool uses TiN coated cutter blades with a radical chip breaker to direct heat away from the tube surface. The ESCO Mongoose MILLHOG® Battery Powered Beveling Tool is priced from $4,395.00 complete and is available for rent at $182.50 per week.